Our office suites within Johnstone House are highly sought after, attracting high-octane companies in need of seamlessly managed and elegant office space. 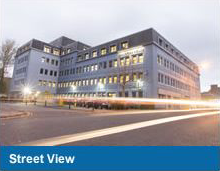 The elegant foyer and quality facilities set Johnstone House apart from other office complexes in Aberdeen, while the prime location within this international city offers opportunities to multi-national and hyper-local businesses alike. To join the dynamic environment of Johnstone House, please get in touch with our team to discuss your business needs. From Aberdeen Airport: The airport is situated near Dyce Railway Station and serviced by the number 80 Jet Connect bus service, which connects to the train timetable. From Aberdeen Railway Station: Johnstone House is a mere 0.7 miles from Aberdeen Station, a pleasant 15-minute walk or 10 minutes by taxi. Local Bus Firms: Bluebird/Stagecoach and First Bus have regular bus routes providing travel throughout Aberdeen and further afield. Local Taxi Firms: Taxis can be pre-booked by contacting Rainbow City Taxis on 01224 878787 or Aberdeen Airport Taxis on 01224 674021. 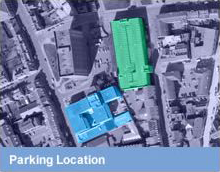 Car Parking at Johnstone House: Ample parking is available within a neighbouring multi-storey public car park on Chapel Street.